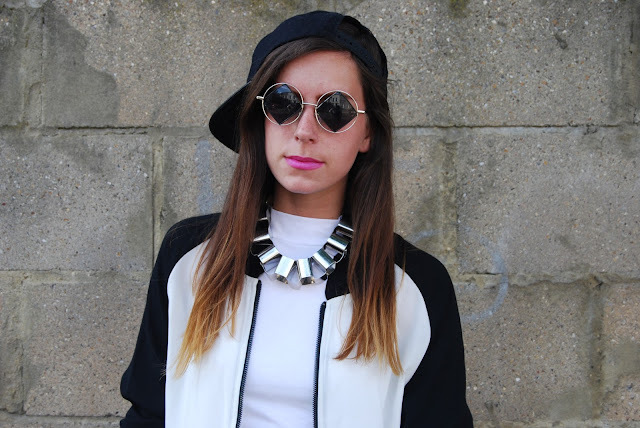 A clean monochrome sports look is something I am massively buying into at the moment. The mix between premium tailoring and sporty shapes make great clean outfits and look fresh and on trend. Since icons like Rita Ora made this look cool it wasn't look before the high street brought into bomber jackets, runner shorts and sporty influenced styles. The silky premium fabrics and tailored cuts make the look feel grown up but still have an edge. Key items like a premium jogger worn with a blazer and jersey tee allow this trend be on for everyone to adapt to their own wardrobe! We felt a monochrome take on the modern trend would look clean and premium, I went for a monochrome baseball jacket from website Evie Hart. The silky material and sporty style made it perfect for this look buy it here! Roll neck jerseys are always fab for sporty looks and when Primark sell them for around £3 make sure you stock up! They are great for layering underneath things like in Amy's look. My Miss Guided PU runner shorts are always a hit for me and I added a netted sweater round the waist which also looks fab over the roll neck jersey! I went for statement accessories with this look, a statement Topshop premium necklace, diamond cut out sunnies, Zara holographic clutch and black hat for that ultimate sporty feel. What are your thoughts on premium sports looks- will you be dressing for sports day this summer? Do you love our blog? Awwww, great, I love it! Everything is so amazing! I really admire everything you do. The outfit is beyond appraisals but I wish I had a glimpse of the shoes you're wearing in the picture. It is because the shoes play a vital role in fashion. Thanks for the pictures. Superb.. in your all post necklace is always unique, I like this changes.